Clinical data for UNC HR/CSC enrolled subjects is available from both the UNC Hospital Tumor Registry (NC state-mandated data collection) and the linked Carolina Data Warehouse for Health (CDWH) electronic medical records data. The UNC hospital Tumor Registry data includes final pathologically confirmed diagnosis, tumor stage and grade as well as first course of treatment. 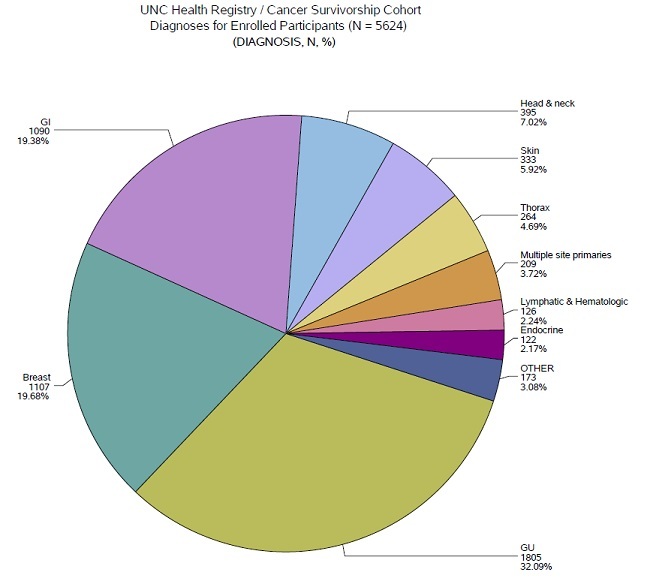 Below is a summary of UNC HR/CSC enrolled subjects and their respective UNC Hospital Tumor Registry data available as well as the distribution of diagnoses (click chart slices for more details). Clinical data is available upon request via the Data Sharing tab either as summary data (Cohort Discovery), available without an approved IRB application, or as individual-level data (Begin your project here), with an HR/CSC approved proposal and approved IRB application.